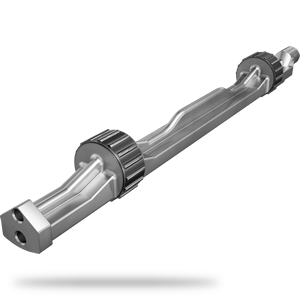 The reduction of cylinders in modern engines has led to the emergence of balance shafts. These balance shafts, which undergo induction hardening, compensate for the engine vibration cause by the lower number of cylinders. The rising demand of low-consumption engines also means an increase in demand for balance shafts. The following video shows the induction hardening of bearing sets for the balance shaft. As a result of the length of the shafts, the induction hardening process is carried out on a MIND-M 1000 hardening system, which can handle workpieces up to 1,000 mm in length. The stationary hardening process shown here is an established one often used for this application. eldec has already accumulated a wealth of experience in the induction hardening of balance shafts and can supply the ideal solutions with its wide range of hardening systems in the MIND series.